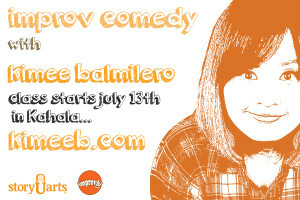 About the Class: Head Sillypino and Founder of Improvhi, Kimee Balmilero will be starting up an 8 week beginning improv at the Kahala Corner Studios in…erm…Kahala. In this class, students will learn the basic of tools of long form improv and start to create comedic scenes. At the end of the program, students will perform an open showcase so they can show off their newly found skills. Hawaii born actor, Kimee Balmilero has been performing professionally since 1994 thanks to her first paying gig as “Woody Woodpecker” at an Earth Day Fair. Other professional credits include: The 3X Emmy Nominated series “Hi-5,” the Original Broadway Cast of “Mamma Mia,” “Miss Saigon,” and “Hawaii Five-0.” While working in NYC and LA for 15+ years, she studied improv and sketch comedy at the famed Uprights Citizens Brigade Theatre. A member of the award winning sketch comedy troupe “Drug Puppy”, Kimee has performed at such venues as: UCB in LA, Second City-Hollywood, iO West, Radio City Music Hall and the Kodak Theater.